As a digital marketer you are flooded with a million things to do every day. The rate at which you are expected to produce content, monitor campaigns and analyze data keeps accelerating. You are asked to do more and more, yet still expected to find time to learn in order to keep up with the latest trends. If this sounds all too familiar then keep reading. What I’m about to share with you may cause you to rethink the way you do link outreach, launch PPC campaigns, approach content marketing and interact socially. I wrote this for digital marketing agencies and in-house marketing professionals who are trying to do the most they can with the limited resources they have. Sometimes, I don’t think that our clients truly appreciate how much time, energy, thought and dedication really goes into their projects. Later on, I’ll tell you how many hours it took to write this 3,000+ word guest blog post and why this length is significant. Guess a number in your head and we’ll see how close you are. Why should you read the whole article and not just skim through it? Because it’s going to be worth your time. Each word was carefully chosen. What you learn might trigger new ideas in your head as you think through the different possibilities. I know you can’t see everyone in this picture, but something weird is going on. There are about 20 people that wanted to keep learning 2 hours after my session had ended. And no, these people weren’t buying something I was selling. Many had just paid hundreds of dollars and flown thousands of miles to hear me speak, so I promise this will be a good use of your time. For years, SEOs like you and me lived and breathed PageRank in order to determine the strength of a link coming from a domain or page. In a Webmaster Hangout, when Google’s John Mueller said, “We’ll probably not going to be updating it going forward at least in the toolbar PageRank” I think a little part of my soul died. Don’t believe me? Watch the video for about 10 seconds, then pause and keep reading. All of us had been holding on for more than a year that visible toolbar Pagerank would be updated. One day we’ll probably look back and remember the “good ‘ol days of PageRank” like we do with meta keywords. Don’t you just love it when someone tells you they know SEO and then starts immediately talking about meta keywords? But now it’s time to let go, so you don’t become “that silly person” talking about PageRank like it’s still cool like meta keywords. If you still need more proof that it’s really dead, here’s a graph of interest over time from Google Trends. As valuable as it was, PageRank never really gave SEOs a way to determine link relevance. Until Topical Trust Flow, SEOs never had a fast and easy way to sort by relevance because the work had to be done manually. Topical Trust Flow (not tropical) is how authoritative and trustworthy a domain or URL is within its niche and what the topic of the content is about. The content that links to a page helps determine its Topical Trust Flow, so the more referring domains the more accurate Topical Trust Flow is. It also isn’t easily faked out like me and 16,996 other LinkedIn users, which you’ll learn about next. This is just one reason why other digital marketers had this to say when Topical Trust Flow was first launched. 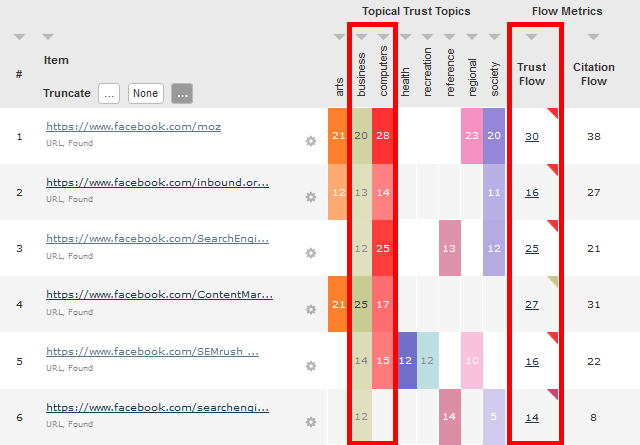 Yes, I even picked users with good Topical Trust Flow for our niche. You have a choice, continue to pray to the Google gods that PageRank is updated and it suddenly includes topical PageRank or continue to pay close attention as I explain 5 valuable ways you can use Majestic data every day. Just like you’ve made the right career choice, you’re also making the right decision by learning more about Topical Trust Flow. According to the Search Metrics Ranking Factors Study, social signals from Google+, Facebook, Pinterest and Twitter are playing an increased role in search results. So why not track down and connect with the most authoritative individuals and brands in your niche? 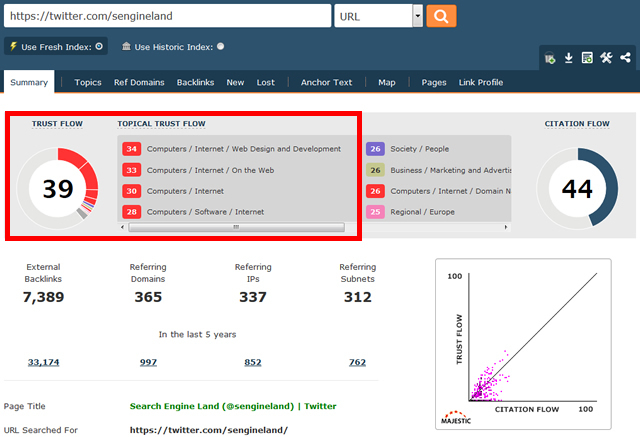 For example, @sengineland looks like a good brand to connect with in the SEO industry because of the high Topical Trust Flow score in the Computers / Internet category. Do you see why? Be sure to avoid Unnatural Profiles! Using an awesome tool like Followerwonk can help you find Twitter profiles with the most tweets and followers for a keyword, but it doesn’t show the full picture. You can also download the top 50,000 Twitter profiles from Majestic. It’s amazing how much more you can get done when you combine data from two tools. Both of these profiles look pretty authoritative until we take a closer look using Topical Trust Flow. Who do you think is more reputable and influential? Danny Sullivan @dannysullivan with Search Engine Land? Or Alex Valter known as @greatspoke? Let’s find out. It’s no contest. I’d rather have Danny Sullivan tweet a link to my latest content marketing article any day over Alex Valter. Minus the fake Twitter followers, how is it possible that 212,774 people got tricked by @greatspoke? Did they just re-follow because the account was popular? You might even be guilty of it. It’s not just fake profiles you have to watch out for, but also fake groups. Take a look at the LinkedIn groups you joined to help make your profile look more professional. Here’s an example of a spammy group that me and 16,996 others joined on accident. Really? Never worry about Google’s algorithm again. Keep this in mind as you read through the next sections. Do you really want to keep writing crappy blog posts that no one reads because you’re blogging just for the sake of blogging? I hate to break it to you, but that isn’t inbound or content marketing. If you feel like it’s time to do something different, you’ll love the next parts. In an article by Seer Interactive called 123 Placements to Block on the Google Display Network they also identified the 10 best performing websites. Maybe we can use Topical Trust Flow to arrive at the same conclusion? Who doesn’t want to spend less money on traffic that won’t convert, right? Here are the top 10 performers from their test. 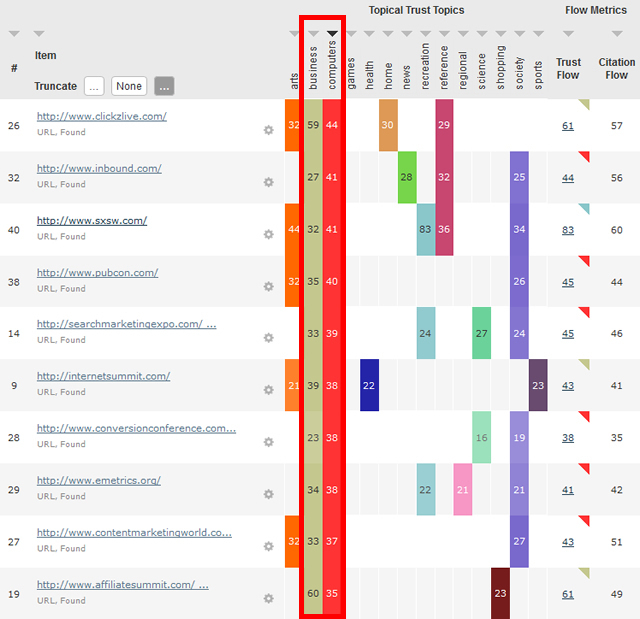 Notice that all of the best sites have domain Trust Flow 69+ and high Topical Trust Flow across multiple categories. Coincidence? Now let’s compare that to the average Trust Flow of the domains they recommended blocking. 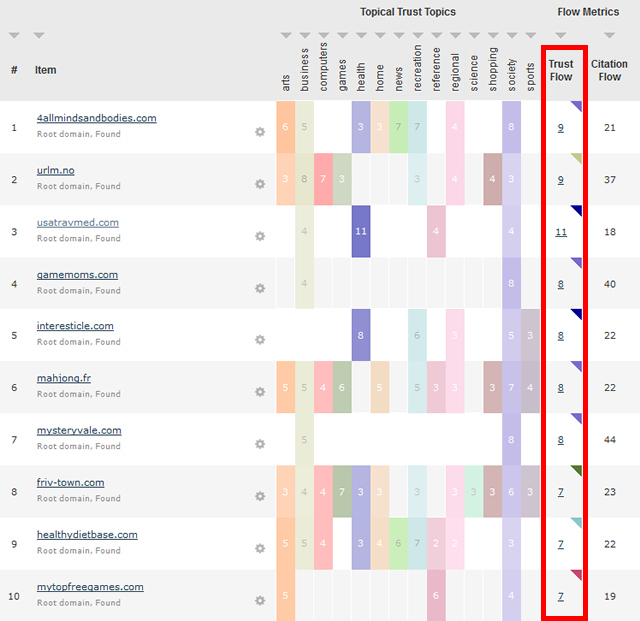 After sorting by domain Trust Flow, these 10 sites reflect the average domain Trust Flow of the 123 bad domains. However, most of the bad websites had a domain Trust Flow of 0. It doesn’t take a genius to figure out that domains with low Trust Flow don’t perform as well. So why are you still buying traffic from these sites? 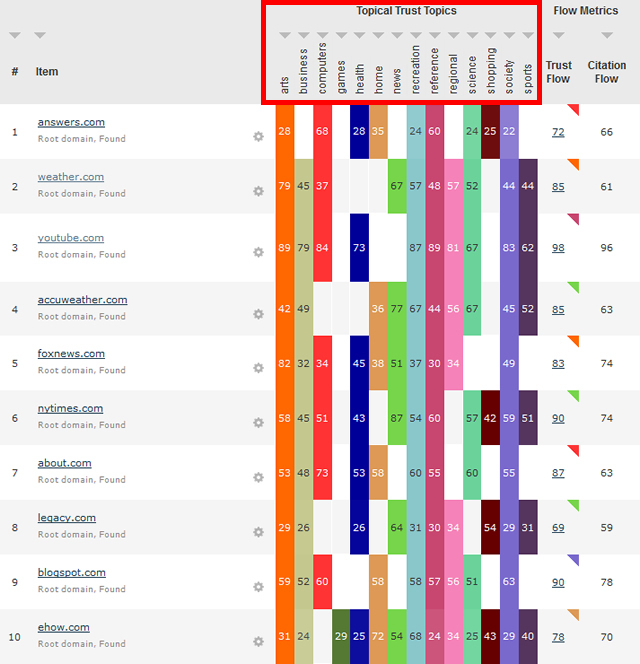 A majority of these domains had poorly defined Topical Trust Flow with most of the categories in the single digits. Compare that to the best performers, which had at least one Topical Trust Flow category score of 60+. You just learned how to use Trust Flow to save ad spend by quickly eliminating low quality sites after receiving an impression rather than waiting for several clicks. Then continue to filter out sites based on Topical Trust Flow that aren’t relevant to your niche. Sites with high Topical Trust Flow scores across many categories, like Facebook, have visitors with a wide range of interests so be sure to use custom targeting when available. Within Facebook, you can also target groups and pages that your target audience “Like”. One thing that I was surprised by was how few referring domains each brand’s Facebook page had compared to the main website. The strongest links pointing at each Facebook page that influenced Topical Trust Flow the most were from their main website. Keep reading to see why I flew 4,000 miles to get this guest blog post on Majestic. 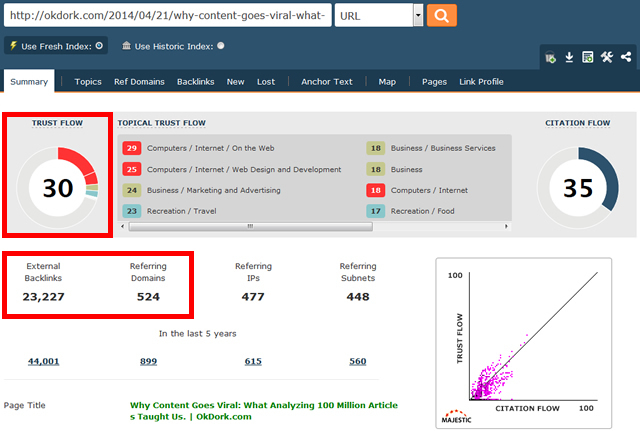 This is a great guest blog post from BuzzSumo on Why Content Goes Viral. I even tried to follow some of their tips when writing this guest blog post. Their study mentions that articles with 3,000+ plus words got almost twice as many shares as articles with less than 1,000 words. When pitching guest blog posts you are more likely to have success when reaching out to people within your niche. Notice how both of these domains have the Computer category as their highest Topical Trust Flow. For your digital marketing website, the two Topical Trust Flow categories you should focus on are Computers and Business. I hope it’s not surprising that the guest blog post received links from sites within the same categories. It would have been unnatural to have seen a high Topical Trust Flow from the category Pets. Know what I mean? I know that doing outreach for guest blog posts can be difficult and time consuming. Let me take you through my process of pitching to Majestic for this post. In March, I started prospecting websites and sending emails. But even before that I was a subscriber to the tool. The subdomain where this post is featured has high Topical Trust Flow in the categories Computers and Business. This is a perfect match for the link profile I want to sculpt. This is my email exchange with Majestic’s editor. On my first attempt, I was told to try again in May. You need to remember that just like you, everyone else is busy. Be patient and flexible enough to work around their schedule. What you might not realize is that I live in the United States and I’m flying 4,000 miles to London to speak at a conference. Conferences are the perfect place to pitch in person. Why? because I have social proof that validates my email. After meeting, we decided on a couple of topics that were my strengths and set clear expectations. Guest blogging needs to be mutual, as a writer it can’t be me first. It needs to be about the company’s audience first, the company second and you third. If you are thinking about guest blogging just for a link you need to re-evaluate your strategy. This post took more than 50 hours to write, how close was your guess? It’s a waste of time to write a guest blog post just for a few links at the bottom of the article! To truly produce content worth reading, sharing and linking to it takes time and the budget to really amplify your reach. 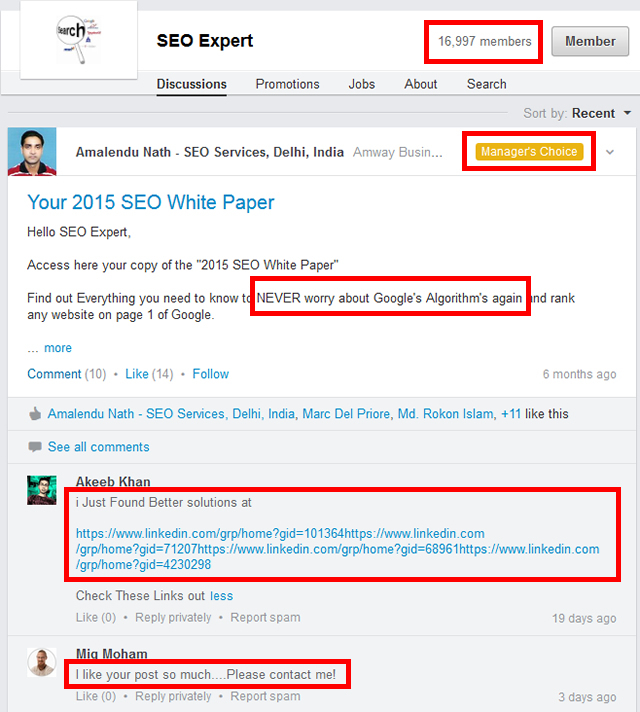 You can also use this method as part of your link outreach strategy. 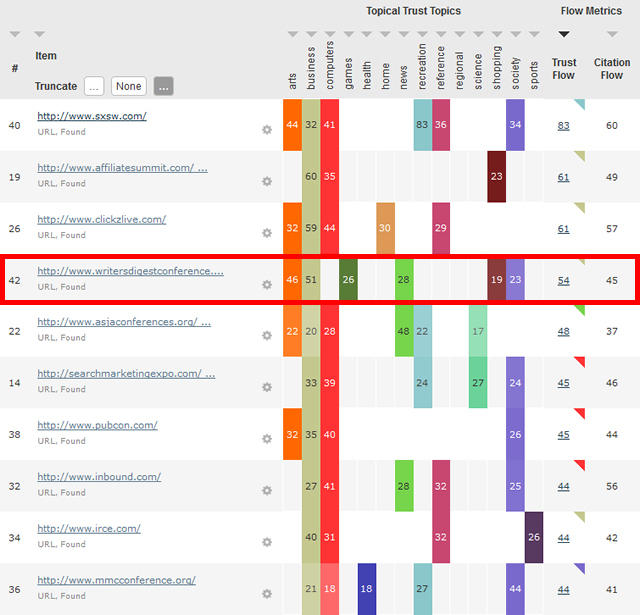 First identify links that your competitors have in common using Clique Hunter then download the data and sort by Topical Trust Flow to find the placements most relevant to your website. At the beginning of this article, I said that this industry changes fast. If you aren’t attending at least one conference per year, make a commitment to yourself to start going. Let’s say you are a speaker or attendee and you only have the time and budget to travel to one or two conferences a year. You need to figure out which ones will give the biggest reach, right audience and best people to network with. Pitching takes time so how can you prioritize. I found this awesome List of Marketing Conferences. Don’t forget, you are going to get a backlink from your speaker profile, so why not maximize the value. Here are the conferences sorted by Trust Flow. Remember this is like sorting by PageRank, which doesn’t provide context. The conference that sticks out like a sore thumb is Writer’s Digest, which is missing Topical Trust Flow from the Computer category. Hopefully you don’t end up there by mistake. Here’s the same list of conferences sorted by Topical Trust Flow. This looks a lot better. Don’t you agree? Based on this new list you could visit these websites and dig a little bit deeper to figure out which ones have the largest audience and speakers most relevant to you. 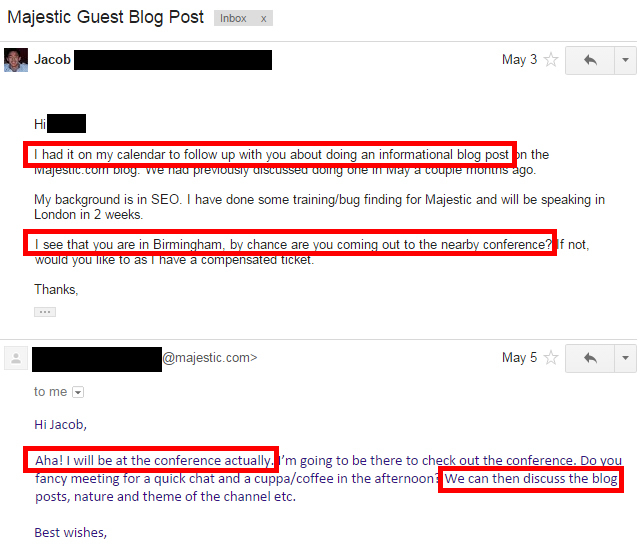 How have I personally used conferences? Without attending the conference in London, chances are this blog post which you should share and link to probably wouldn’t have happened. Or this guide on Keyword Research which is the all-time, most shared article on the SEMrush blog to date. I wouldn’t have met @wilreynolds at MN Search where I learned about and referenced his company’s GDN Study in this article. What do you think networking can do for you? How can you get started speaking? Present at your local digital marketing MeetUp group. I use my local group, Digital Marketing Minnesota, to attract new business, build local star power and test presentations in front of a forgiving audience. You can also do the same on webinars and hangouts. Everyone keeps saying that only big brands are ranking, but is that really true? Being big is relative. To a minnow a fish is big and to a fish a shark is big. Make sense? In this section, you’ll see that Google isn’t afraid to punish big brands. Look at how popular Amazon is compared to GNC. If Amazon is a shark, GNC is a small fish. How can a small fish swim with the sharks? Here is the search history provided by SERPWoo for one of the spammiest commercial keywords on the internet. The health supplement “garcinia cambogia” gets searched more than 1 million times each month. 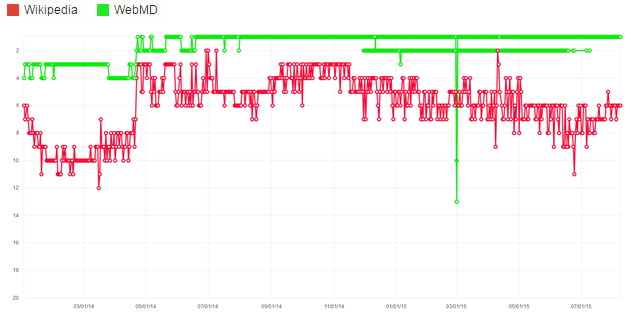 In gray, you can see the ranking positions of Amazon.com since December 2013. There’s something weird going on. How can Amazon go from #1 to not even ranking? Every time an Amazon product starts ranking in the top 10 it gets manually removed. Just because Amazon is an authority in shopping doesn’t mean that the product being sold is the best answer. 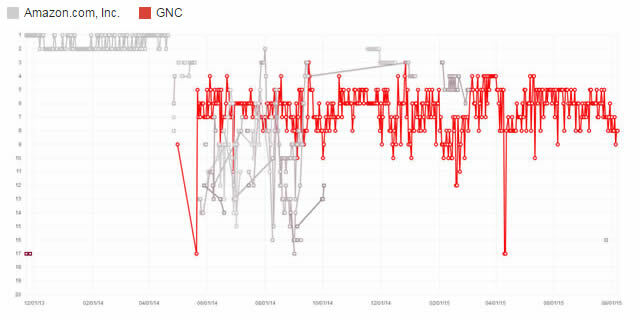 In red, GNC is still a huge brand, but it pales in comparison to Amazon. Yet, they still compete because they are considered an authority in the niche. In fact, they are the only product page that consistently ranks, most of the results for the search query are just informational pieces. What about the results for people searching for information about garcinia cambogia? Look at how popular Wikipedia is compared to WebMD. If Wikipedia is a shark, WebMD is a small fish. What you’ll notice is that WebMD shown in green consistently outranks Wikipedia.org shown in red. In this niche, it appears that Google prefers content from topically relevant websites verified by an expert over an article with unverified crowd-sourced contributors. Yes, you are right, WebMD is still a huge brand. Remember my minnow, fish, shark example? If Wikipedia is a shark, WebMD is a fish, then this next company Healthline is a minnow. When you look at the following graph, you’ll realize just how small Healthline really is. 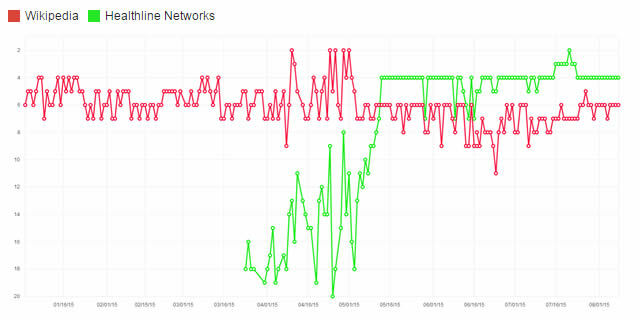 Even though Healthline, shown in green, is much smaller than WebMD, it is another example of how topical authorities earn traffic and compete against big brands like Wikipedia shown in red. For anyone that has outranked Wikipedia or competed for a major keyword you know exactly how impressive this really is. 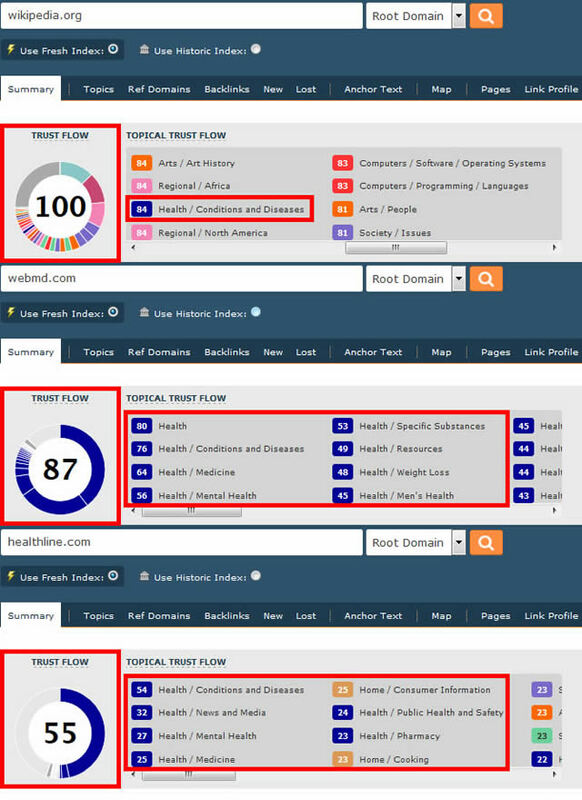 Wikipedia has more domain Trust then WebMD and Healthline, but notice how tightly themed both WebMD and Healthline are around the topic health. There are always exceptions to every rule, but in general don’t expect your crappy website or content to rank! Ask yourself, if my content or product was removed from the internet would anyone really miss it? “I heard that Google only punishes small websites”. Wrong! This is an example of what a manual SERP review by Google looks like. You can watch the video until 1:04 then keep reading. It didn’t matter if the content was on an authority website or a spammy site. If the page wasn’t useful or got rankings unnaturally it was dropped. And the truth is no one misses any of those pages. What’s the big take away? Even with Google favoring big brands, being a topical authority and best answer still matters. Even though Wikipedia is trustworthy across many different subjects, a tightly themed website can still compete and even outrank big brands. What can minnows do? Produce content that is truly the best answer and promote it in topically relevant places. 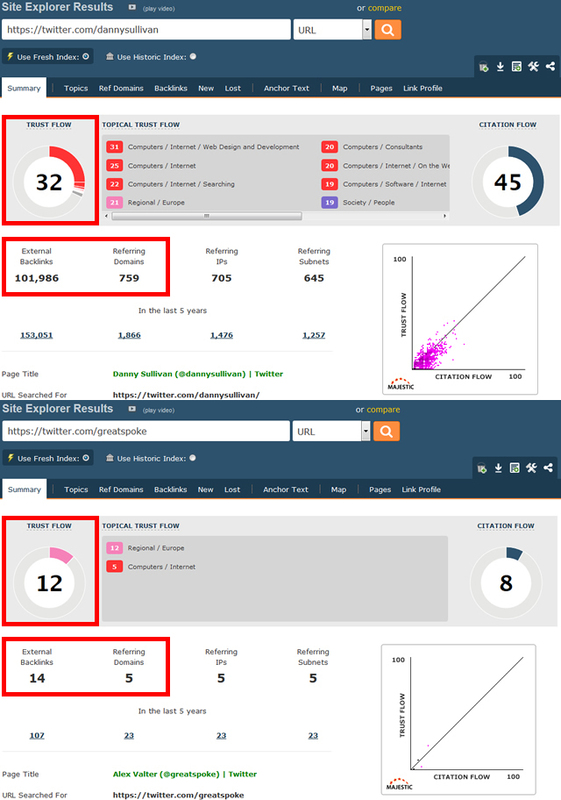 Use the Bulk Backlink Checker to quickly analyze your competition. This is the same tool I used to produce many of the images in this blog post. Known as the speaker “who gets mobbed” at conferences, Jacob Hagberg is a search engine optimization consultant who helps digital marketing agencies get results for their clients. Follow him on Twitter @jacobhagberg or connect on LinkedIn. If you’ve ever thought, “Wouldn’t it be nice if we could outsource SEO audits, keyword research and offpage strategy to a company that actually knew what they were doing, so we could focus on website redesigns and PPC” then please visit his agency’s website Orange Fox for more information. Jacob – that really is an awesome post! One of the strongest guest posts we have ever had on the Majestic blog… and we do not generally allow very many. I do not think there is anything else on the market that is anything like Topical Trust Flow, and you certainly nailed why it is so much more the just another metric. I did not get the chance to read this when it went out, but that was because I saw a demo internally for a new representation of a certain part of TTF that you demonstrated regarding influencers on Twitter above. We liked it so much, we are going to try and bring something out for everyone asap. Phenomenal post Jacob! We read in a ton of SEO groups that PR is dead but what happens next is never really talked about. The Topical Trust Flow (TTF) is clearly the next step and one of the most important metrics to look at. Since you mentioned this to me months ago I have been watching sites that are ranking and there is a heavy correlation between the TTF and rankings on almost every SERP. As a seo copywriter i love your thoughts. Never read so many true words in the last time. Get your engaging content shared in the right format in front of the right audience is not an easy job. Thanks for bringing this up. A pleasure to read! Thanks for comment! I definitely respect your work as a copywriter. One of the hardest skills to develop, especially with all of the complexities of NLP, embedded commands, open loops etc. I think it’s one of missing elements to good content marketing too. There is a glossary of Majestic terms that can be found here. Think of Topical Trust Flow as how trustworthy a domain or page is inside a specific niche. Awesome post Jacob! I know we were talking about this a few weeks ago before everything went live, but you’re spot on with everything and very few people do a good job articulating "why" it’s as important as it is. TTF is my favorite metric because it’s the hardest to fake. Jacob this was a wonderful read. I have thought for a while now that high PR is on its way out, but as Brad stated above not much is discussed when it comes to the ‘next steps’. It’s good to know that being a topical authority matters! Thank you for engaging with my article, I really do appreciate it. Honestly, it’s about trying to put it all together for the business. What do I mean? Great content, promoted to the right audience, with the right calls to action means more sales…. but it’s a lot easier said than done. In a perfect world…. great content, gets great backlinks, ranks high in search engines and sends boatloads of targeted traffic eager to buy. But here’s the truth, unless your content is AWESOME and gets promoted in the right places it won’t get backlinks. You have to promote it! Otherwise you are missing out on building up your domain’s trust, brand equity and foolishly leaving money on the table. To date, this post is just 87 shares shy of being the all-time most shared blog post on Majestic, which is pretty cool. So thank you everyone for your support. The beauty is it creates social proof that other marketers, just like you, want to be part of. This is good content to share with your followers because it makes you look good and you’re doing me a huge favor. So to answer your question. What are the next steps? I’ll give you a hint and maybe Majestic will have me back to do a follow up post on the topic. But, I want, what everyone wants… higher rankings and more sales because of backlinks earned from high topical trust flow domains and pages.